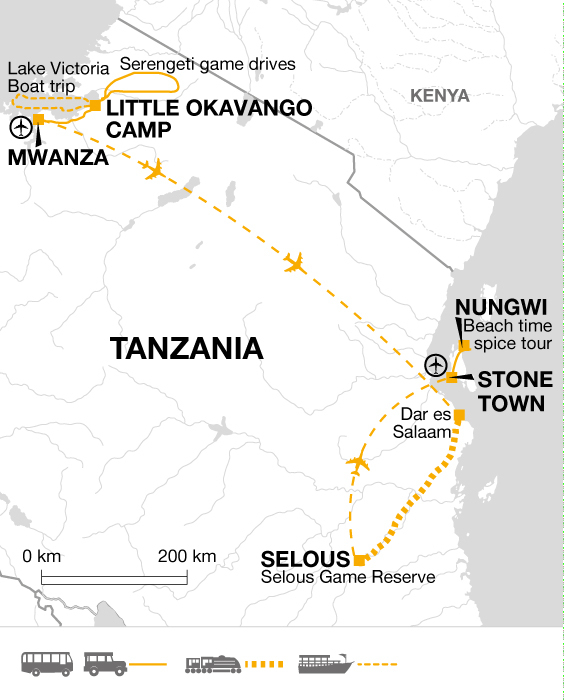 Get off the beaten path and discover the best of Tanzania on this East African adventure. Explore the waterways and channels of Little Okavango on the shores of Lake Victoria and meet fisherman from the Sukuma tribe. Search for the Big Five whilst avoiding the crowds in Serengeti's Western Corridor, an untamed wild area of park. Spend a couple of days game driving and walking around the rivers, lakes and swamps of Selous Game Reserve, the largest reserve in Africa. After so much activity and excitement relax at a boutique hotel on the beach in Zanzibar. Canoe trip along the waterways leading to Lake Victoria US$25 per person. Nature Walk US$10 per person. Comfortable shoes, trainers or sandals. A flexible holdall (suitcases are not suitable for vehicle luggage racks) and a daysac. Bring a small torch, sunglasses, sunhat and sunblock . We also recommend you bring binoculars. Accordingly, you should allow approx US$65 per person. On this trip we are staying in small intimate lodges that are full of character. On Lake Victoria our accommodation is Little Okavango Camp, where we stay in spacious wooden cabins and will have the camp to ourselves. Sable Mountain Lodge is set in the Beho Beho hills of Selous and we stay in comfortable wooden bandas (an African cottage), the lodge has a swimming pool and the Landrover's Return bar. In Zanzibar we stay in the boutique Zanzibari Hotel, located on the beachfront with a swimming pool and air conditioned rooms. Tanzania: A single visa is required by UK, New Zealand, Australian, US & Canadian citizens. Visas can be arranged on arrival, but due to queues at immigration we recommend visas are arranged in advance. Explore are the only UK operator offering this itinerary combining the western corridor of the Serengeti with Selous and Zanzibar and staying at premium and intimate lodges. This trip will take you away from the crowds of 4WDs in the Eastern Serengeti and take you on a journey into the wilderness, where Africa comes alive with the sounds of the bush.